The life of Muhammad Ali opened a national discussion as to whether any athlete now would sacrifice for principle. Michael Bennett and Seahawks assistant coach Kris Rixhard think that is unlikely. RENTON — Among the many contemplations about the significance of the life of Muhammad Ali was a recurring question of whether any contemporary athlete can come close to his political and social impact. 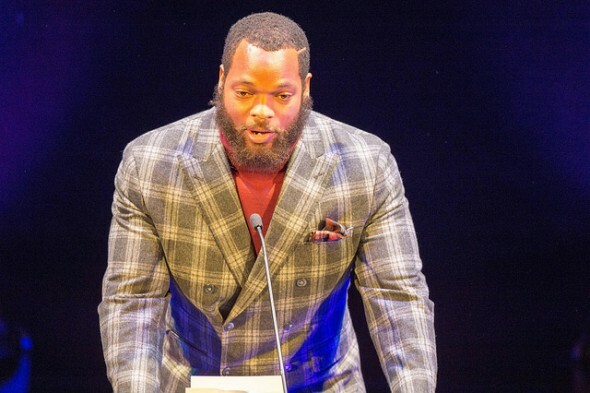 So I asked the one guy in the Seattle sports marketplace who has the wit, independence and perspective beyond sports to even be on the outskirts of consideration: Seahawks DE Michael Bennett. No surprise that he was honest, blunt and right. To review, Ali, at the height of his skills and profile, refused induction to the Army in 1967 to serve in Vietnam, claiming conscientious-objector status because of his Islamic faith. He appealed his jail sentence, but was banned from boxing. The legal process took 3½ years before the U.S. Supreme Court voted 8-0 to reverse the conviction. In the time of his professional purgatory, the national mood, which began with much contempt for Ali’s principled stance, turned, with many people coming to awareness that the war was a cataclysmic failure of U.S. policy, judgment and values. Ali, who at the beginning of his conversion to the Nation of Islam was a believer in the kind of segregation espoused by Malcolm X, changed as well, adopting the values of integration and equality of justice and opportunity advocated by Martin Luther King. The cultural tumult of the 1960s is unlikely to be understood well by anyone who did not live the times. But Ali managed to transcend time, race and generations because his principled stand was an epochal moment in the history of black people in America, not to mention for many others who also felt disenfranchised. The point was not lost on another Seahawk figure with a wider view, defensive coordinator Kris Richard. “We’ll never have a grasp of an era that we did not live in,” he said after practice Thursday. “All we have are the stories of his impact at a time when black people did not have a voice. “We didn’t have a name, a voice, an identity. His was an identity of strength, excellence and the absence of fear. He was brash, but what we don’t give him enough credit for is his big heart. In death, Ali probably has been elevated to a kind of secular sainthood that obscures his human shortcomings and missteps. But there is no arguing his aspiration to living a principled public life, which in contemporary times would include such things as spurning commercial endorsements that are in conflict with personal values. “You see great athletes (advocating) eating at McDonalds,” Bennett said. “Everybody knows they don’t eat at McDonalds, or drink Coca-Cola. They give a bad influence to kids. Asked whether an athlete today could emulate Ali’s willingness to sacrifice, Bennett was skeptical. “I think an athlete now could, but none of them want to,” he said. “There’s too much pressure (for conformity). All anyone cares about is what’s on their Twitter or Instagram. Guys think too much about what people think. Richard agreed that another Ali-style outlier was possible but unlikely, partly because the world is so different now with nearly everyone having access to a publishing platform that has the capacity to reach a global audience quickly. When Ali was influential, national media largely was confined to three TV networks and a few big newspapers and radio stations. Ali used his quick wit and bodacious personality to break though on all the conventional outlets of the day. “He was the first of his kind in an era when athletes did not have that voice,” Richard said. “He put himself on his own pedestal, because the opportunity presented itself. It won’t have the same impact today. It’s a fair point that world has changed in many ways since Ali’s heyday. When everyone has a voice, it becomes harder to hear. But it would be a shame if Bennett is right, that the courage of one’s convictions is so readily purchased. Spoken by a person who did not live in the 60’s, as I did. Clay then Ali was ALL ABOUT self-promotion, 100%. Concerning endorsements, there were NO Blacks’ endorsing products in the 60’s. The first successful Black promoter was OJ and he did that beginning in the late 70’s/early 80’s. No company would touch a Black prior to OJ to promote a product. So Ali promoted himself and as a result drew HUGE crowds and his fights on TV, ABC (he made Howard Cosell), were watched by everyone. We would all get together for the Ali fight – it was “must see” TV. Arguably the biggest TV draws of the time. Take away his being drafted, and I dare say he would not have had an impact on Vietnam – he would have continued his fighting, his commercial success and HE would have been the first Black product endorser, not OJ. Once people got used to Ali’s shtick, he truly became a national figure that all were behind. His being drafted put him in a position he had not asked for. He stuck to his beliefs and took an incredible amount of “incoming” for his position, but was committed and eventually was vindicated. During that time away from boxing was when Ali truly understood what an impact he could have on furthering rights for Blacks and became a national spokesman. In the end, as you were of age in the 60’s also Art, you had to have been there to truly understand. The 60’s were like no other in US history. Speak for yourself. I only wish Frazier broke his jaw like Norton did. In my early 20’s then, and being white, when Ali first arrived before his conversion and especially afterwards, I didn’t quite know how to handle him. I loved his boxing skills, but outside of those, I was dumbfounded. He wasn’t Sugar Ray Robinson or Floyd Patterson. He wasn’t Joe Lewis. His choices probably registered on the negative side of my thinking. Then, along came Howard Cossell. Their relationship and Howard’s skillful but genuine interpretation of Ali’s plight changed my thinking. When Ali was banned from boxing, I was outrageously upset that I and the rest of the boxing worlds fans were being robbed, let alone Ali. Watching Ali fight at the live broadcast at the Key Arena rates alongside watching Elvis perform live at the Key as well. Both were kings, and how I miss them.